Earlier this year, Amazon announced that e-books were outselling print books. The statistics echo those from other sources, such as the Association of American Publishers, which indicate consumers have a strong interest in digital formats. But when it comes to textbooks, many students say they still prefer traditional, print copies. Sure, textbooks are notoriously heavy and expensive. But print still offers one thing that digital books hasn't been able to do quite right yet: Allow the reader to take detailed notes in the margins. But a new company called Highlighter hopes to address that problem by offering a way to help publishers enable marginalia, of sorts, on their websites. 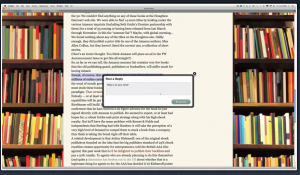 Highlighter allows readers to leave comments not just at the end of blog posts but throughout. Visitors to websites can also highlight, annotate, save and share passages and comments. While the new tool can be used by any publisher (or more broadly, by anyone with a blog or a website), the startup is focusing a lot of their efforts on encouraging adoption among academics -- both publishers and professors. University of Colorado biology professor Michael Klymkowsky has installed Highlighter on his Biofundamentals course website, for example. By doing so, students are able to engage fully with all the materials -- the syllabus as well as the readings. They can leave comments, ask questions, and save and share key passages. Highlighter also offers analytics for publishers, so in this case, Klymkowsky can see what students are reading, what they're highlighting and sharing -- all metrics to help him gauge their engagement and understanding. "When we are looking for real subject mastery, it is critical that students have the opportunity to engage the hard and often counterintuitive ideas presented and to articulate and refine their understanding," says Klymkowsky. "The ability to actively comment on the text, respond to questions, and each other's answers, helps them prepare for classroom discussions with their instructors -- helps them get ready for the Socratic process of learning. Unfortunately, this type of engagement is all too rare with 'static' texts and large classes."